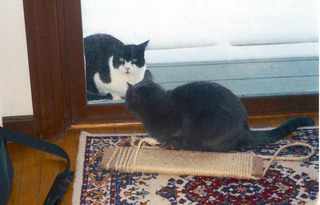 A sequel to "Mail-Order Wings"
My cat Tabby was the model for Samuel Tail in The Ghastly Glasses. Cats, friends, magical powers: a hilarious mix! The huge eye stared at them through the rainy dusk. Was this the right optometrist? Aunt Bets is convinced that it is, but Andrea thinks it's all pretty strange. The sign on the door says BIRPP - Borderline Institute for Research in Psychic Phenomena, explains Valerie Weirse, the white-coated woman inside. Andrea does get a pair of glasses there, although she's not sure what Valerie Weirse means by "the improvements that are possible with them." But Andrea soon finds out. When she uses the glasses' magical powers, strange problems pop up at home and school. In the end, she has to decide how to foil Ms. Weirse's terrible plans for the Ghastly Glasses. 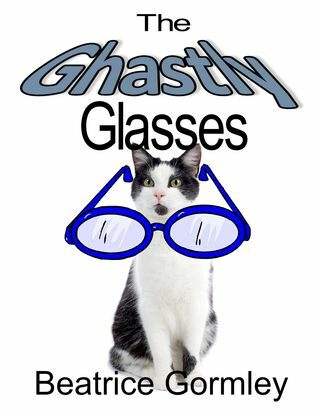 Praise for "The Ghastly Glasses"